Asus has launched NFC Express, an external accessory for PCs that makes it easy to pair desktop computers and Android NFC phones and tablets so users can share data between devices and use their mobile phone as a remote control for their PC. 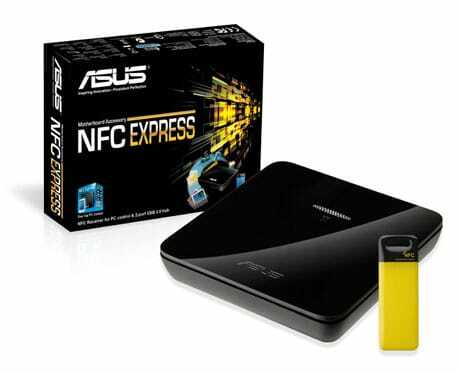 NFC Express is bundled with Asus’ new Z87-Deluxe/Dual motherboards and is also available to purchase separately. “NFC Express allows for convenient wire-free pairing of desktop PCs with Android smart devices, quick content sharing, and remote PC control, all with one tap,” says Asus. “NFC Express automatically backs up content added to Android devices since last syncing them with a desktop PC. “The Remote Desktop function allows for viewing and controlling PCs via Android smartphones and tablets, while Quick Launch saves shortcuts to favourite apps, which can then be started with the ease of a single tap. NFC Express connects to the host PC via USB, and “as an added bonus” incorporates two further USB 3.0 ports. The device also ships with an Asus-branded keyfob-style NFC tag. Don’t most people with an Asus laptop/ultrabook already “pair” to their Android device through software solutions such as AirDroid (free) or Teleport Extender (free). I send SMS messages from my laptop; share files between laptop and device, all without a custom piece of hardware in the middle. Would an NFC solution be easier? Or, does it just add “bulk” to the portable world?